The Digital Library of Georgia is pleased to announce the availability of the Southern School News now in the Civil Rights Digital Library and soon the Digital Public Library of America. The Southern School News Archive provides online access to the complete run of the newspaper, published from 1954 until 1965. The monthly paper was the product of the Southern Education Reporting Service, a Ford Foundation-backed group of Southern newspaper editors who sought to report on issues in desegregation in schools of all sizes and levels — from the smallest rural schoolhouses to large state universities — across the American South. The aim of this project was clear and solid: report the events impartially, dispassionately, and as completely as possible. 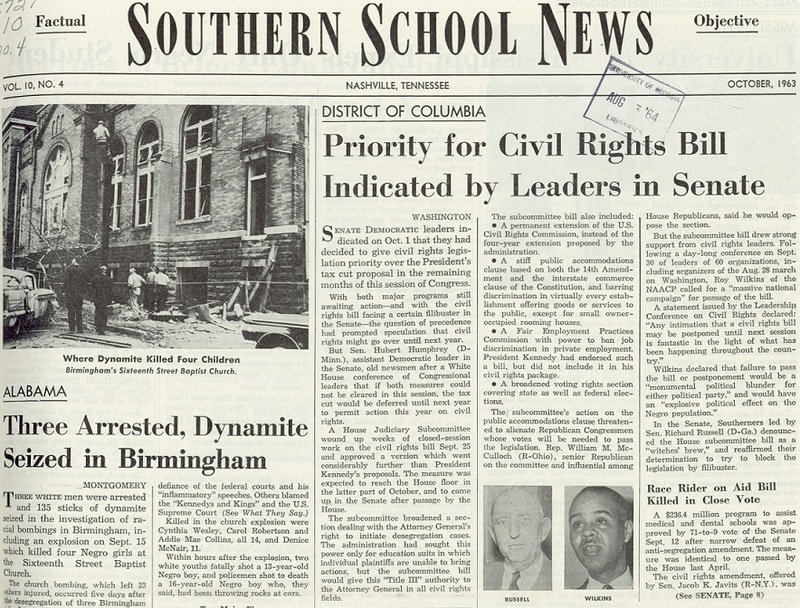 Southern School News is the official publication of the Southern Education Reporting Service, an objective, fact-finding agency established by southern newspaper editors and educators with the aim of providing accurate, unbiased information to school administrators, public officials and interested lay citizens on developments in education arising from the U.S. Supreme Court opinion of May 17, 1954 declaring segregation in the schools unconstitutional. SERS is not an advocate, is neither pro-segregation nor anti-segregation, but simply reports the facts as it finds them, state by state. 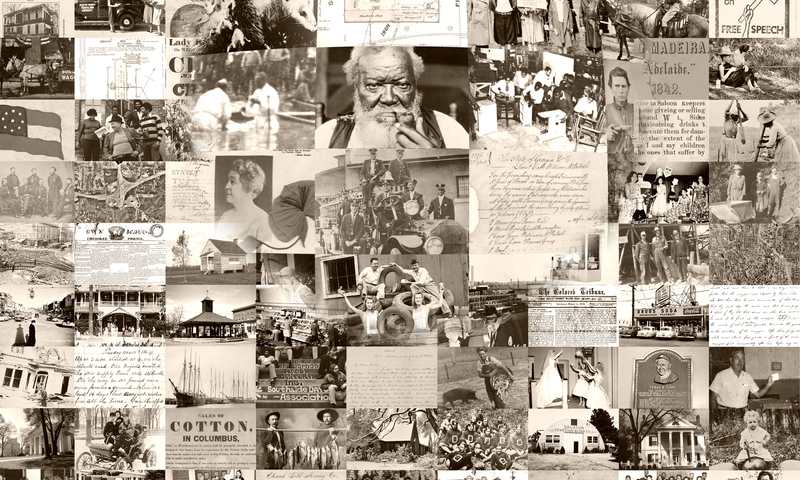 The Southern School News Archive is available through the Civil Rights Digital Library, a rich digital resource that serves as a portal providing a seamless virtual library on the Civil Rights Movement drawing on holdings from more than 75 libraries and allied organizations from across the nation. Southern School News, October 1963. Featured stories include the 16th Street Baptist Church bombing in Birmingham, Alabama, and debate surrounding President Kennedy’s civil rights bill (later to be signed into law as the Civil Rights Act of 1964 by President Johnson). As a service hub for the Digital Public Library of America (DPLA), the Digital Library of Georgia (DLG) provides digitization and metadata assistance for its partner institutions around the state. The DLG also aggregates and shares metadata about digital items with the DPLA, allowing the DPLA to act as a portal to these collections. Thanks to grants from the John S. and James L. Knight Foundation and the Arcadia Fund, the Digital Library of Georgia has digitized and described these items for inclusion in both the DLG and the DPLA. I had kept copies of Southern School News which I first learned about when I lived in New Orleans from 1952 ro 1956. I kept them for many years and even brought them to Westchester County (New York) after we left New Orleans. I kept them for many years and during a later move had to get rid of them. I was a former free-lance writer (New York Times and other publications) with a special interest in education and recently , while thinking about the state of education currently, thought about that publication and how much on target it was and in many ways still is. I’m glad to know that you have them in your possession . Bravo for that. For the Southern School News, the March 1963 edition is actually the February 1963 edition. The March edition did not get scanned.